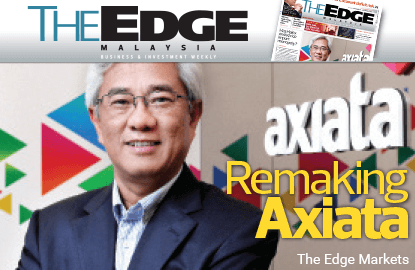 What is Axiata's game plan? KUALA LUMPUR (Nov 28): Khazanah Nasional Bhd's regional mobile champion, Axiata Group Bhd, is seeking to morph into a 'new generation telco by 2020', but it may be puzzling to some that the group isn't all that clear right now on what the term actually means. Its president and group chief executive Datuk Seri Jamaludin Ibrahim, in a candid interview published in The Edge Malaysia (Nov 30-Dec 6), is not shy or embarassed to admit that "I really don't know what it means...all I know is that it will be very different from where we are today...at least in a results perspective, our business model should be quite different from what we have today". His statement is perhaps not surprising, as no telcos in the world really do have a clear idea where things are headed, as the weekly noted, because the landscape for telcos are changing at such a fast pace that Jamaludin, despite having doubled Axiata's market capitalisation, revenue and profit after talking the helm of the mobile telco group in 2008, is still "a man in a hurry". For dwindling profits from providing simple voice calls and short messaging services (SMS) that have previously made incumbent providers cash cows and attracted newcomers is no longer a winning formula, and Jamaludin is acutely aware of that. While he can't yet define what Axiata will become, one thing's for sure is that it can't be a normal telco selling voice and minutes and data anymore, nor can it just bank on selling mobile airtime. Some telcos in the world, armed with a bigger balance sheet and market base, are mirroring the behaviour of the world's biggest IT companies that are turning into conglomerates via acquisition. Just across the causeway, Singapore Telecommunications Ltd too has been making acquisitions of various sizes to grow its portfolio. Axiata, which has recently seen its Robi Axiata - Bangladesh's second largest operator by revenue now - entering into a joint venture with Trust Bank to provide mobile financial services just weeks after announcing a partnership with digital security provider Gemalto NV, is not to be left behind. It is investing 1% to 1.5% of its revenue annually in new businesses that would complement its core, and/or acquisitions. "Not doing anything is the most dangerous thing, but putting too much money is high risk," Jamaluddin told the weekly. 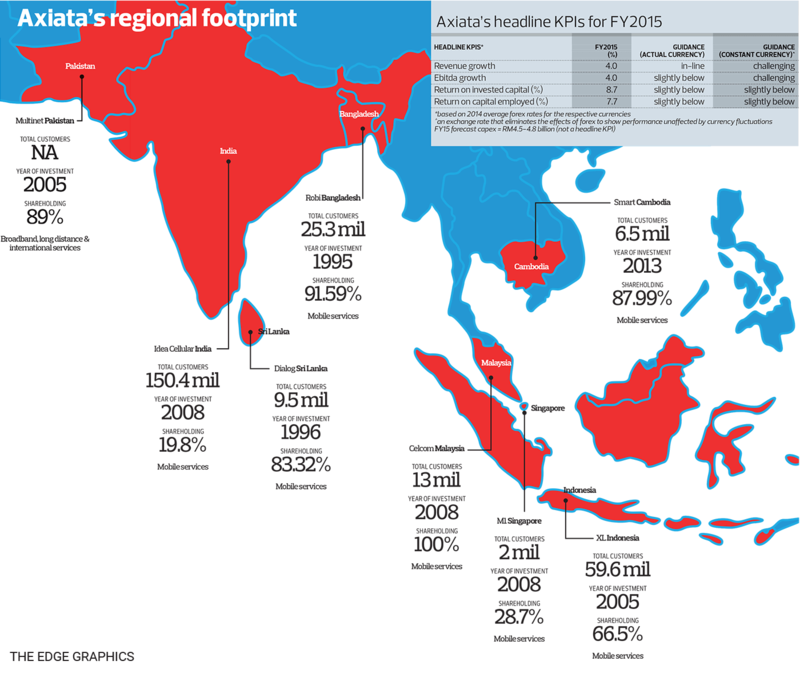 As to whether Axiata will have a new revenue stream from advertising or something other than the traditional voice and data as it transforms itself, should be evident within three years, the paper wrote. “We started last year. Right now, you see dotted lines. By 2017, you will see the dotted lines connected and there will be greater clarity on what our revenue will look like. How we combine the so-called disparate initiatives into revenue generators will come together by end-2017. By then, I can tell you how the new generation telco should be like,” said Jamaluddin. But, as the paper noted, with 20 'hold' recommendations versus 10 'buys' now, will investors have the patience to sit back and see if the new formula would be just as good as the old? Those with shorter-term horizons may not be, but for the longer term ones, which Axiata is actively engaging, the wait may be worth it. Pick up a copy of The Edge Malaysia from newsstands around you to find out more about Axiata's plans, and if its latest third quarter ended Sept 30 earnings, which saw a 40% jump in net profit to RM891.39 million, thanks to foreign exchange (forex) translation gains and one-off gains from the sale of towers in PT XL Axiata, is keeping it on track to achieving its key performance indicators for the year. P/S: The Edge Malaysia can also be downloaded from Apple’s Newsstand and Androids’ Google Play.